For many of us in Boulder, we have read much but had little reason to visit the area called Boulder Junction. We just discovered a delicious reason, provided you let your tastebuds take charge. This all takes place between 30th Street and the railroad tracks and centered on Pearl Street. Frankly, the details and the developments seem to run together in one big construction mess. We know the Hyatt Place is operating and there appear to be a number of condo units nearby – there are, in reality, six separate mixed-use developments completed or in the works, not including the gigantic new Google campus practically across the street. But there is one little gem that makes it worth your while to visit Boulder Junction: the Roadhouse Boulder Depot restaurant. The historic train depot building was built in 1890 in downtown Boulder but saw its last train in 1957. It was purchased by the Boulder Jaycees in 1973 to save it, moved to its current location just north of 31st and Pearl Streets in 2008, and sat empty until the Roadhouse opened late last year. The Roadhouse Boulder Depot opened in December, 2015 and is part of the Roadhouse Hospitality Group, founded by brothers Terry, Dan, Mike, and John Shipp, University of Colorado alumni who now own 16 different restaurants. While this does seem to give the Boulder Depot a certain professionalism in terms of service and food quality, the vibe does not seem too chain-like. And who can blame a quad of local boys who have done well? The actual depot has been renovated extensively and, in some ways, it is hard to recognize it is an old railroad depot. However, the interior is extremely comfortable, the outside is beautiful, and the patio dining looks upon a sort of urban park owned by the city. And the restaurant clearly pays tribute to its past with historic photos on the wall and a tradition of handing out free drink tokens whenever a train passes on the nearby tracks. Gimmicky, but fun! The menu is broad, with a focus on flatbread pizzas, salads, burgers, and main courses. 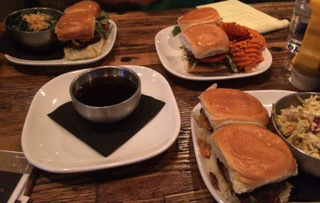 We can highly recommend the Roadhouse Burger that comes with au jus sauce, the Zen Turkey burger that comes with goat cheese and roasted red pepper, and the BBQ shrimp tacos. 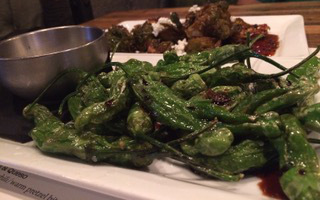 Both the Shishito Peppers (with a random amount of hotness depending on the pepper) and the goat cheese and sweet & spicy-flavored Brussels Sprouts are great starters. On the other hand, the enchiladas were ordinary, at best. The service is truly outstanding, led by manager Katie Kingston, and the beer list is just right, with draft brews categorized by Hoppy, Ales, Light, Dark & Malty, or Rare & Unusual. When we visited, all 24 draft beers were from Colorado. Granted, we who live here might not have reason to visit the Hyatt Place Hotel or any of the existing developments. But take time out of your schedule to make a trip to the new Roadhouse Boulder Depot. It is worth the visit for food and drink as much as the history. Our writers Allan Wright and Allan Parr dined as guests of the establishment. However, the views here are entirely their own. 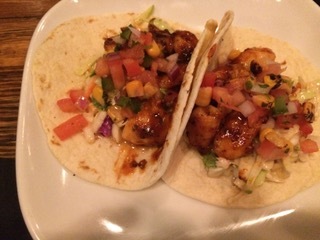 EDB writer Leah Arthur also reviewed the Boulder Depot soon after it opened.